In this video we will discuss about inserting, updating and deleting data using detailsview and objectdatasource control. Step 1: Drag and drop a gridview control, a detailsview control and 2 objectdatasource controls on webform1.aspx. Step 2: Add a class file, with name = EmployeeDataAccessLayer.cs to your project. Copy and paste the following code. Step 3: Build your solution, so that the employee data access layer class is compiled. Step 4: Configure ObjectDataSource1 control to retrieve data from EmployeeDataAccessLayer. Use GetAllEmployeesBasicDetails() as the SELECT method. Step 5: Asscociate ObjectDataSource1 control with Gridview1 control, and make sure "Enable Selection" checkbox is checked. Step 6: Configure ObjectDataSource2 control to retrieve data from EmployeeDataAccessLayer. Use GetEmployeesFullDetailsById(int Id) as the SELECT method. The value for the parameter - Id should come from the selected row in GridView1 control. Also, select INSERT, UPDATE and DELETE methods. Step 7: Associate ObjectDataSource2 with DetailsView1 control and make sure the following checkboxes are selected. Step 8: Generate ItemInserted, ItemUpdated and ItemDeleted event handler methods for DetailsView1 control. Step 10: Set GridView1, DataKeyNames to "Id"
Step 11: Run the application. Select a row in gridview, and click "Edit". Notice that Id is also editable. To make it non editable, set ReadOnly attribute to true. Step 12: Click on "New" link button in detailsview to insert a new row. 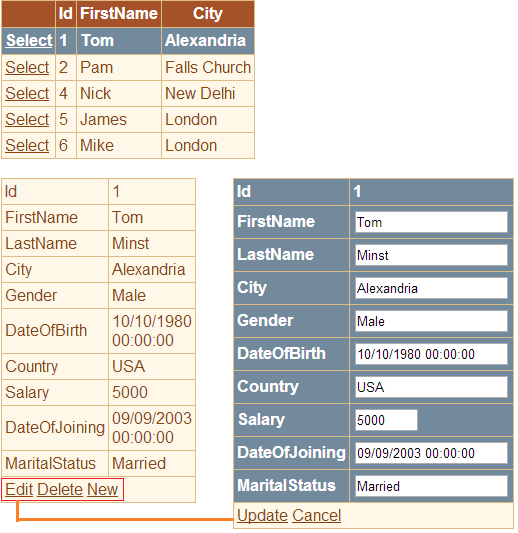 Notice that, the interface shows a textbox for Id column. This column in the database is identity column, and we don't have to supply a value for it. To make it invisible, set InsertVisible attribute to false. Setp 13: Click on Edit, change a few values, and click "Update". Notice that none of the rows are updated. To solve this issue, set DataKeyNames="Id" on DetailsView1 control.